If you look around my house, it takes all of 1 second to realize I have kids. Toys and lessons and stuffed animals and blankets are found in pretty much every room of the house. But if you were to look strictly at the walls of my house, it would not be as apparent that children live here (aside from our wall of family pictures). We could definitely do a better job of incorporating more free-spirited and fun pieces of art in our home; pieces that will delight children. I was delighted when Nidhi Chanani, a well-respected artist from San Francisco, contacted me to see if I’d like to check out her work. She makes art that most anyone would enjoy, but I think she has a very special knack for pieces that will speak to children. Darah and I spent about 15 minutes admiring Nidhi’s work, and Darah kept coming back to the print of the bear taking a shower. It made her giggle, and she said she’d love to look at it while she takes her baths. So now this print is in our bathroom for Darah to enjoy, and it certainly makes me smile to see it, too. I mean….how cute are these pieces?! I’ve definitely got Nidhi’s Etsy site bookmarked to return to when it is time for Layah to graduate to a “big girl” room from the nursery. Are you currently trying to come up with ideas for gifts to give to others this holiday season? Have you been asked to give ideas for yourself and are drawing a blank? Well going green is HUGE for a second year in a row, so I would love to suggest that you think closely about gift ideas that support reducing, reusing and recyling in all its various forms. One way that has really caught on big is something called “up-cycling.” This is basically when you take an item and repurpose its parts to make something way cooler than what it originally was. Today I’m bringing you a very cool up-cycled product! Check out these pillowcase totes from Unique Rabbit! Kimberly, the owner of Unique Rabbit, has taken vintage pillowcases and turned them into fabulous bags that can serve a variety of purposes. These can hold your groceries, serve as a diaper bag, a toy holder, a library book holder (that’s what I use mine for every single week!) or any other number of purposes. And since it is made from vintage fabrics that are pretty much one-of-a-kind at this point, what you have will be totally unique. And isn’t it fun to have something that NOBODY else has? You know it is! The bag is also super soft, which simply makes it nice to carry! 🙂 Every time I take my bag out (which is every week!) someone comments on how very cool it is. I can’t say enough about what a fantastic gift idea this is, especially if you are on a tight budget. Including shipping, this bag will set you back $10.50. That’s $10.50 for a handmade, one-of-a-kind, super cute, super green, super functional gift. Kimberly only has a few of these in stock, so jump on them now before they are gone! Unique Rabbit is one of the very first stores that I ever featured on my blog. For that reason, and because Kimberly makes wonderful products, this is a store that I have so much love for in my heart! Please take a moment to look around her shop and see if anything catches your eye. Oh, and if you aren’t using paperless towels at this point in your kitchen, please do yourself a favor and purchase some right now. Her prices can’t be beat! Win it! 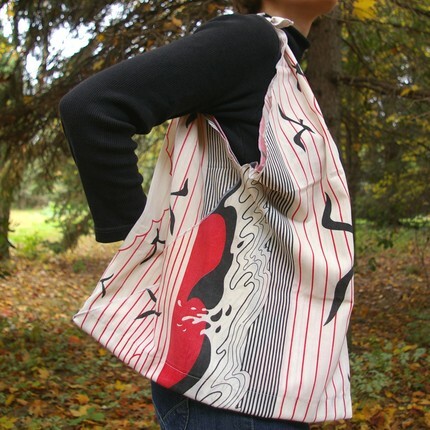 : Would you like to win an up-cycled tote? Of course you would! Here’s your chance! The contest will run until November 7th at 11:59pm EST when a winner will be selected using Random.org. The winner will have 48 hours to respond to the notification before the prize is forfeited and a new winner is drawn Open to residents of the United States. Limit one entrant per household, please. Mandatory entry: Tell me about a time you re-purposed something. Sewing doesn’t have to be involved! For example: I recently re-purposed a beautiful short stem vase that hadn’t been used in years into a pencil and pen holder on my desk! 1. Sponsor love: Add Unique Rabbit to your Etsy favorites! 2. Blogger love: Follow Stuff Parents Need on Google Friend Connect (totally easy and no big deal to sign up if you haven’t before! Just check out my sidebar). Be sure to check out the other current giveaways, found on the sidebar of my homepage. My giveaways typically have good odds! So Chattanooga, or at least my back yard in Chattanooga, seems to have a bit of a mosquito problem. Just now, here at the end of October, the mosquitoes seem to be finally leaving/dying/whatever it is that bugs do for the winter. Thank goodness! Darah and I like to sit on the back porch and wait for Tim to ride home on his bike, and EVERY.SINGLE.TIME. we do this, I get bit once if I’m lucky, but usually 3 or 4 times. I hate it! I thought about breaking out the Off! with Deet, but that stuff is so toxic, and Darah is always sitting with me, so that’s just not an option. I want something that is not as bad for me as it is for the mosquitoes. 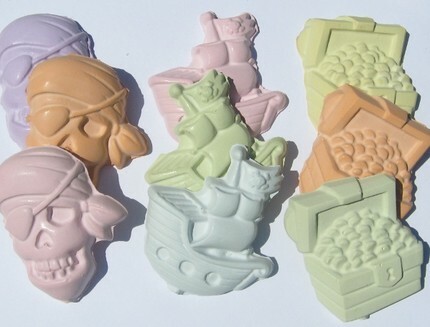 There’s a fabulous little shop on Etsy called Cake Face that offers a soap designed to keep you smelling fabulous AND keep those little buggers off of you. 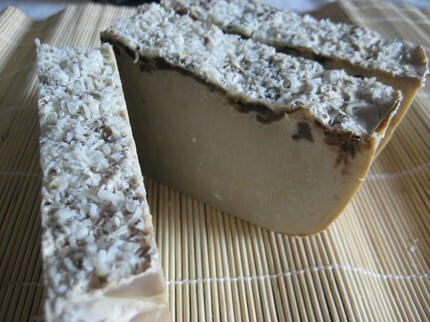 I am totally in love with this soap. It smells like citronella and sunshine. What a fabulous trick Mother Nature played by making something that smells so great to humans smell so repulsive to mosquitoes! While mosquito season is probably over in your neck of the woods, too, I think this soap is a something you’ll definitely want to have on hand for when those blood suckers make their triumphant return. This is also a wonderful gift idea for anyone you know who seems to be a strong target for bugs (I’m extremely tasty to mosquitoes, and I envy those of you who aren’t!). I think Cake Face is a very cool company because the owner, Kelsey, has a passion for offering natural skin care products. She has personally experienced the health benefits of using natural products, and she pours her love of all things natural into her work. I can tell that she does so, because the quality of her soap is truly outstanding. In addition to offering this delightful and useful soap, Cake Face also has a beautiful selection of other cold pressed soaps (that eucalyptus tea soap looks AWESOME! ), bath fizzies and candles, and even a few soaps geared towards men (I LOVE the Optimus Prime soap…that was one of Tim’s favorite tv characters growing up!). Buy it! : Looking for some budget-friendly but delightful holiday gift ideas? Shop Cake Face and you’ll definitely have some happy gift recipients! Win it! 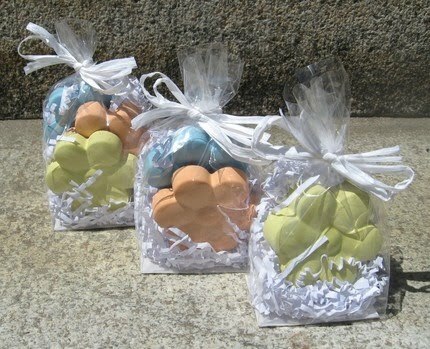 : Cake Face would like to offer one lucky Stuff Parents Need Reader a bar of soap of your choice! Woo hoo! This will make an awesome holiday gift, or keep it and spoil yourself a little bit! 🙂 The contest will run until November 5th at 11:59pm EST when a winner will be selected using Random.org. The winner will have 48 hours to respond to the winning notification before the prize is forfeited and a new winner is selected. Open to residents of the United States. Limit one entrant per household, please. Mandatory entry: Tell Kelsey a smell that you love, especially at bath time. For example: I LOVE this scent that Bath and Body works makes (or used to make, not sure if they still carry it) that is rice flower and shea. To. Die. For. Be sure to enter my other current giveaways, located on the sidebar of my home page. I received a complimentary product for review purposes. The opinions expressed here are strictly my own. Brandi, the brains behind an Etsy shop I love (Pannaz), has brought us several super cute products over the past few months, including her reusable nursing pads, her custom soft-soled shoes, and her amazing pillowcase dresses. She has outdone herself once again! Check out these adorable reusable bags! Darah will be toting these to Parent’s Day out for the next few years, and they will also be going with her to preschool and kindergarten! The velcro is sturdy, but not too difficult for little hands to open. 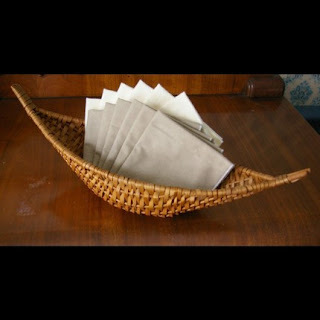 I am especially keen on the size and shape of the snack bags Brandi makes. They are short, but also long, which means they will hold things like string cheese very well. They are also the perfect container for some grapes or the ever-popular goldfish. The sandwich bag can hold…you guessed it…a sandwich! It is also perfect for pretzels, potato chips, large crackers or carrot sticks. The very first day I used them, I had some milk spill on to the bag while we were en route to daycare. I was so sure that the snacks I had put inside would be wet, but they were completely dry! I was surprised, and so pleased! There are many great reusable bags on the market these days, and the ones Brandi sells at Pannaz are truly perfect for your little ones. The fabric is adorable, the size is just right and they keep messes at bay with their waterproof inner lining. I’ve also washed them several times and they are holding up just beautifully. I’d recommend these to anyone who is sending sending a child to daycare or school with a packed lunch. Buy it! Pannaz has a few different styles to choose from, but if you are looking for certain colors or patterns, just send Brandi a convo and she can work with you to create a custom set. The sandwich and snack bag combo set is a reasonable $12.00! Win it! : Just in time for the new school year, one lucky reader is going to snag a matching sandwich and snack bag in your choice of available fabrics. Yipee! The contest will run until September 11th at 7:59pm CST when a winner will be drawn using Random.org. The winner will have 48 hours to respond to the winning notification before the prize is forfeited and a new winner is drawn. Open to residents of the United States. Limit one entrant per household, please. Mandatory entry: Tell me about snacks in your house. What does your family munch on in between meals? 3. Suggest something for Brandi to make and offer in her shop. Be sure to enter my other current giveaways (listed on the sidebar of my main page). Disclosure: I received complimentary products to facilitate my review. The opinions expressed here are strictly my own. It is DANG hot here in Memphis. When we are at home, I often let Darah spend a fair amount of the day just in her (cloth!) diaper. I know that helps her stay cool and she seems to like it. Of course, there are occasions that demand clothing. What is a good solution that will cover up my child but that will also breathe well? One of my favorite Etsy shop owners, Brandi (of Pannaz fame), has a solution. She makes pillowcase dresses that are extremely functional during the hot months. They are also unbelievably cute. Darah stays cool when she has hers on, and she looks fabulous! The dress is really easy to slip on and off, and so far, Darah hasn’t squirmed too much whenever I’m tying the bows on her shoulders. She only pulled at it once, so it is proving to be not too big of a temptation (thank goodness!). Darah is really big into crawling right now, which can make dress-wearing a challenge. Fortunately, Brandi makes these dresses short enough that Darah can scoot around with ease when she has hers on. It is a wardrobe winner, for sure. Also, the fabric that is used is so bright and cheerful! Today is Darah’s birthday, and this is the dress she is wearing, because it is so festive-looking. Buy it! : Pannaz has so many cute things for sale (at VERY reasonable prices). Check out the shop to see what you can’t resist (I be you’ll find something). These adorable pillowcase dresses are only $15 (that’s such an awesome deal for a dress that is handmade with love!). Win it! 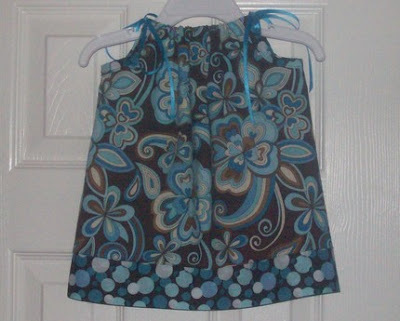 : One lucky Stuff Parents Need reader is going to snag a pillowcase dress from Pannaz. The contest will run until August 17th at 7:59 CST when a winner will be selected using Random.org. The winner will be contacted and will have 48 hours to respond before the prize is forfeited and a new winner is selected. Open to residents of the United States. Limit one entrant per household, please. Mandatory entry: Tell me the pillowcase dress you like the very best in Brandi’s shop! Be sure to enter my other current giveaways (found on the sidebar of my main page). Disclosure: I received a complimentary product to facilitate my review. The opinions expressed here are strictly my own. I’m starting to realize that part of the culture of children’s birthday parties includes party favors. I think when I was little, I would occasionally go to a birthday party where we could go home with a pencil and some stickers (actually, I distinctly remember getting one of those funky mechanical pencils that was glittery and thinking that it was the greatest party EVER). But I think the bar has been raised a bit, and now parents are left scrambling to find favors that won’t disappoint. I find this very strange, and I hope that I don’t fall into that mindset when Darah gets a little bit older and starts to have birthday parties with guests. I don’t mind sending kids home with a little something fun, but I’m totally not interested in loading them up with plastic crap (which is what the affordable favors are) or with spending a lot of money just in impress the kids and/or their parents (and also give them anxiety about what they will have to buy for favors when it is their child’s party). I found an Etsy store that has a PERFECT solution for the favor dilemma. Check out The Chalk Shop! Mel is an awesome mom who runs this store out of her smoke-free home. She started out making art chalk for her 21 month old daughter, and then she learned how to make the chalk in all sorts of different shapes. This makes for unique chalk pieces that are so much fun. They are fun to look at, fun to play with (what kid doesn’t LOVE chalk? ), and they are reasonably priced, so that you don’t bust your party budget! Mel enjoys working with her customers to make the perfect shapes and colors to meet you needs. I actually found the store in February when I was looking for the perfect gift for one of my nieces. At the time she was really into trains and she also liked chalk. Well, The Chalk Shop happened to offer chalk in the shape of trains. PERFECT!!! If you have an idea for a chalk design, send Mel a convo through Etsy and she’ll let you know if she can make it happen! It takes two weeks for custom orders to be shipped, as they need adequate time to dry before shiping. 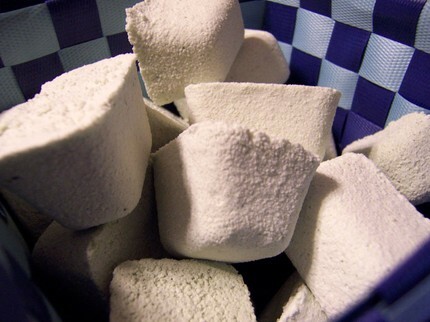 Mel can also wrap up the chalk into beautiful little packages, which makes them perfect to hand out as favors. They are also gift-ready for any other special occasion! Buy it! : I highly recommend The Chalk Shop as a go-to resource for party favors and stocking stuffers. 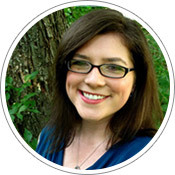 Mel can help you come up with something perfect for you at a price that will make you smile! Each piece is just over $1! Hard to beat, I think! Win it! : Mel sent me a delightful set of flower chalk (3 pieces of chalk, total), beautifully wrapped, for one lucky Stuff Parents Need reader! The contest will run until August 16th at 7:59pm CST when a winner will be selected using Random.org. The winner will have 48 hours to respond to the winning email before the prize is forfeited and a new winner is selected. Open to residents of the United States. Limit one entrant per household, please. Mandatory entry: Tell me your thoughts on party favors for kids. Do you provide them for your parties? Are they fun or do they stress you out? Any comment related to the topic will work! 6. If you are a blogger (wrote a post in the last 3 months) add my button to your site and leave the url so I can see it. Be sure to enter my other current giveaways, found on the sidebar of my main page. Tim and I make no secret about our admiration of our current president, and how our world was rocked (in a positive way) when he was elected. We know that one day we will tell Darah about when we voted for him, and how crazy busy the polls were, and how there was this vibrant energy that we had not yet witnessed in our time as registered voters. It was almost magical. We officially announced our pregnancy to people outside of the family on Inauguration Day. Again, that was such a magical day, and I’ll never forget it. Change was in the air, snow was falling lightly in Memphis (which is relatively rare), and we were telling the world that our baby was on the way. In light of Darah’s Obama connection, we wanted to celebrate her first birthday with a little tribute to our White House resident. I found a Progress shirt at Truly Sanctuary, and I totally fell in love. They have an entire section devoted to Obama onesies! Yipee! Now, I realize that not all of my readers will share the same affinity I have for our remarkable president. And that’s ok. I celebrate the fact that in this country we have freedom of thought and expression! If an Obama onesie probably wouldn’t find its way onto your baby, Truly Sanctuary still has something you’ll like, I guarantee it! Check out their selection of canvas totes (Mr. T bag, you MUST come home with me…), their tattoo art onesies and their extensive selection of music-related clothes! Buy it! : Basically, Truly Sanctuary is the perfect place to shop for something unique, inspiring, or just plain quirky for your little one. Onesies start at $14.99! Win it! 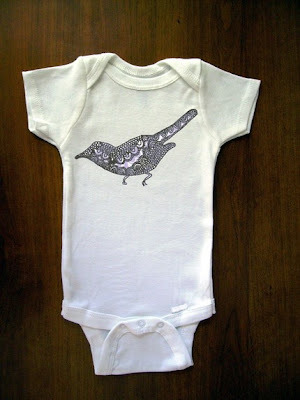 : One lucky Stuff Parents Need reader is going to snag a onesie of your choice from those currently listed on Etsy. Yipee! The contest will run until August 14th at 7:59pm CST when the winner will be selected using Random.org. The winner will be emailed and will have 48 hours to respond before the prize is forfeited and a new winner is selected. Open to residents of the United States. Limit one entrant per household, please. Disclosure: I was sent a complimentary product in order to facilitate my review. The opinions expressed here are strictly my own. 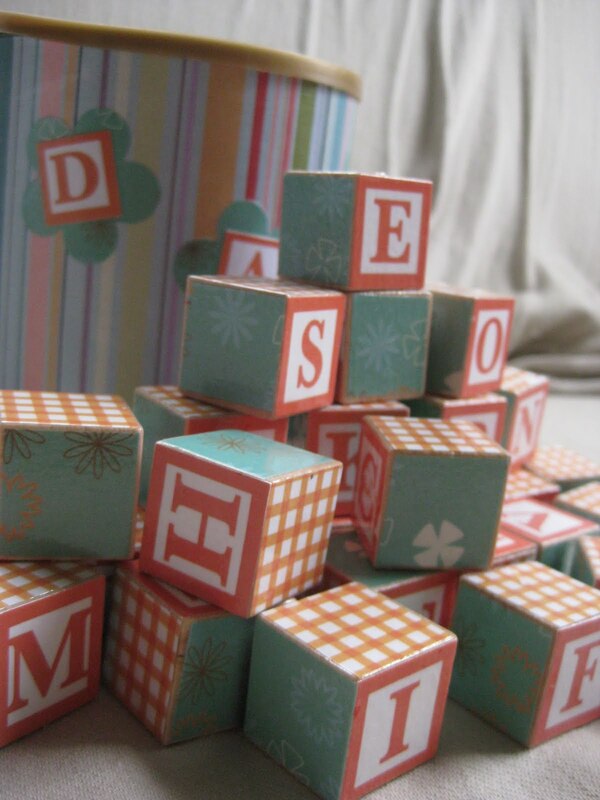 Right around a child’s first birthday, interest in blocks seems to skyrocket (at least Darah’s has). I’ve been on the lookout for some really cool wooden blocks for her. I actually found some on Etsy, but these aren’t any ordinary blocks. They are custom made with adorable color-schemes. I love them in a major way! Emily is always seeking to perfect her products. After getting some feedback about the finish of her blocks being a bit tacky (literally tacky, not unfashionable!) she has changed her formula, and now the blocks are being made with a matte finish. I did notice that our blocks stuck together a little bit after being in the (seriously hot) attic for a few weeks. The canister she sent us has the matte finish, and it looks absolutely perfect. Now, these blocks are already super-cute with their different patterns and designs, but Designed by Lemony can take it one step further for you. Emily can make your blocks with special photos on them, as well. Think about how great it would be to have pictures of your family members and your baby on the blocks. While your little one is learning about stacking, knocking things down, and the alphabet, you can also work on the names of your loved ones. Or you can just put pictures of your baby from his/her first year or two of life on the blocks for a beautiful keepsake. Just TRY to find something this special at Target! Emily is inspired by custom orders, so if you have any special ideas or any particular colors that you’d like to see, just contact her…she can make it happen! Buy it! : The wooden block set is $35 plus $7 shipping, and that includes any customization that you’d like to do to it (including adding pictures!). It comes with 30 blocks and one super cute and coordinating canister (which can have the child’s name on the outside of it). Shipping is free for your second item, by the way! Win it! : Today just might be your lucky day! 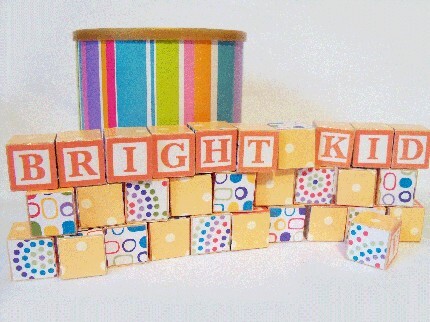 One of you is going to win a CUSTOM set of blocks for the child in your life!!! The contest will run until August 12th at 7:59pm CST when a winner will be selected via Random.org. The winner will have 48 hours to respond to the winning notification before the prize is forfeited and a new winner is drawn. Limit one entrant per household, please. Open to residents of the United States. Mandatory Entry: Tell me the wooden block set you like the best of the ones available! 1. Add Designed by Lemony to your Etsy favorites. Be sure to check out all my other current giveaways (listed on the sidebar of my main page).